It was unquestionably A Dramatic Turn of Events when the co-founder and drummer of Dream Theater, Mike Portnoy, decided to call it a day. I have no doubt the title of this album was inspired by that one life changing event for the band. James LaBrie (vocals), John Petrucci (guitars), John Myung (bass), Jordan Rudess (keyboards) and Mike Mangini (drums) are one of the biggest names in music now as they once again set the standard for the genre after the release of their most recent classic slice of epic progressive metal. The well documented story of the drummer replacement sessions that eventually landed Mike Mangini behind the kit even sparked a parody on the internet by the band Solstice Coil. Good to know that people were at least paying attention. For the first time I decided to pre order the special limited edition boxed set. I dropped $105.00, which is probably fair considering the cost of 180 gram vinyl alone. You get 2 LPs, 2 CDs with one featuring instrumental mixes of each track, 1 DVD chronicling the drummer try out sessions, a frame worthy lithograph of the album cover, a monogramed turntable mat, two high quality picture sleeves with lyrics that you can place the LPs in…and a few lucky recipients will get a lifetime pass to Dream Theater concerts. In case you were wondering, I was not one of the lucky ones. So was it worth it? I would say yes. Would I do it again? I would be tempted to do so, yes. The big question would be just how much the band would miss Portnoy. Judging by the creative process in recording the album and how it sounds I would have to say that most listeners are not going to be able to tell the difference. Mangini was known by the band and he played on James LaBrie’s solo albums. In fact I recall seeing him play side by side with Portnoy back in 2001 at a show at the Orpheum in Boston. So let’s face it, there was already a relationship established with the potential drummer and everyone in the band agreed he stood out the most at the try outs. Even though writing the music is a collaborative effort, the band created all the drum parts and sent them to Mangini for this recording. This is understandable considering the situation at the time. Certainly the next time DT goes into the studio it will be more of a collaborative effort from the drummer’s point of view. There is no mistake that Petrucci is the driving force behind the band now and with the removal of such a strong personality as Portnoy I think the other members were given more creative room to breathe and felt they were more of a band. In fact LaBrie even mentioned that very fact during the sessions earlier this year. 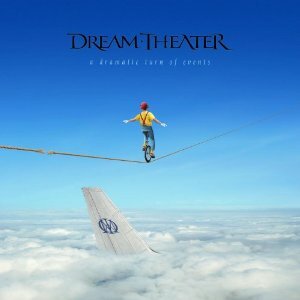 A Dramatic Turn of Events is a very strong album and a victory in many ways for Dream Theater. I commend them for not folding after losing one of their founding members and grabbing the bull by the horns and pushing onward. That very energy and power is felt on this album. It is very heavy, harkening back to albums like Train of Thought and bits and pieces like Octavarium. However, that is for these ears - everyone will get something different from this album and that is the beauty of the Dream Theater experience. The album art sure indicates how delicate life is and how at times we are on a tight rope and at any moment can fall off into oblivion. I believe the point here is that this is a choice we all make. Do we let ourselves free fall to a crashing end or regain our balance and carry on? This is exactly what Dream Theater did after they got the news about Portnoy. A Dramatic Turn of Events has 9 excellent prog-metal songs that focus on all the strengths that this incredible band has to offer. Thought provoking lyrics, exceptional musicianship, and of course epic tracks that change direction at a moment’s notice. The dramatic opener “On The Backs of Angels” is a fruitful entry into the DT catalog of recordings. The accompanying video creates equally compelling images to match the music and lyrics. “Breaking All Illusions” clocks in at 12:25 minutes, while “Bridges In The Sky” is 11:01 and “Lost Not Forgotten” comes in at 10:11. The shortest track is “Far From Heaven” which is only 3:56 minutes long. The best track for musical variety and crazy good changes is “Breaking All Illusions”. James LaBrie’s vocals on this track are magical; I was feeling the chills listening to it. And I have listened several times now with the same result. The opening of the track sounds like something from an Iron Maiden album (one of their acknowledged influences). Those facts speak loudly for the type of music that this band can create for its listeners. DT is masterful at creating images and making them real for their audience and with this release there is no exception to that rule. At every turn Dream Theater delivers on this album. Is it their best? That is a tough call when you love everything they have ever done but I have to say it is one of their best to date. Mike Mangini does a fine job filling the shoes of a legend and it looks as though they made the right choice selecting him as their newest member. Great review! I didn't want to like the album but couldn't help myself!